Findmypast has the largest collection of Irish family history records anywhere online. So where do you start with this goldmine of information on your Irish ancestors? Like all of our record collections, Findmypast's Irish records are divided into nine broad categories. Here's a summary of what you can expect to find in each and how they'll help your family research. Use these records to get the basic information (names, dates and locations) on your Irish family. In Ireland, civil registration of births, marriages and deaths started in 1864 (1845 for non-Catholic marriages). Our 10 million Catholic Parish Registers date back much further. Like BMDs, census records are some of the most used resources in genealogy. Unfortunately, most of Ireland's 19th century census records were destroyed during a fire at the Public Records Office of Ireland in 1922. The two fully surviving censuses that are accessible by the public are from 1901 and 1911. 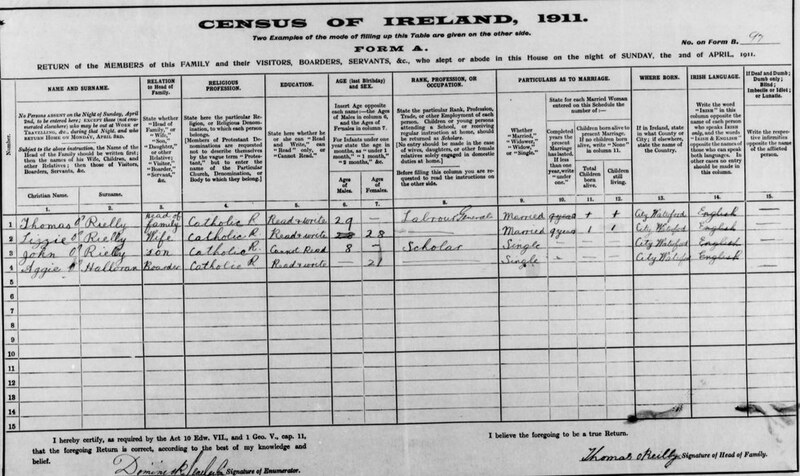 To fill the gap left by a lack of census records, you need to search land and substitute Irish records. Two of the most widely-used collections are Griffith's Valuation and our exclusive Landed Estates Court Rentals. Irish men and women have been involved in some of the most pivotal conflicts in history, both at home and around the globe. Findmypast's Irish military collection includes records of those involved in World War 1, the Easter Rising and more. The number of Irish diaspora around the world today is proof of the high levels of emigration from Ireland during the nineteenth and twentieth centuries. 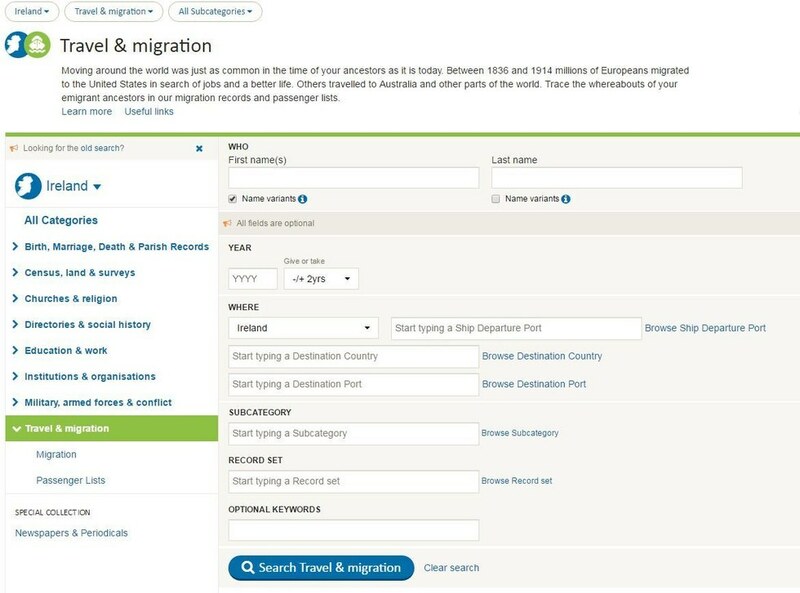 Findmypast has a fascinating array of passenger lists, naturalisation records and other travel resources to help you trace those globetrotting ancestors as they left Ireland behind for a new life. Our Irish newspapers are some of the most popular resources on the site for people tracing their Irish roots and it's easy to see why. If you can't find your ancestor in our other records, be sure to try the newspapers where you could find them mentioned in an article or even see a photograph of them. There are hundreds of titles to explore from every corner of Ireland and the collection is continually growing. This collection is particularly useful for Irish family research because it includes some of the most detailed records available. From court and prison records to workhouse registers and government collections, you might be shocked at what you unearth in these resources. You can explore your relative's school life and how they made a living with our exciting collection of Irish work and education records. You'll find all sorts of resources in this category including school and college registers, crew lists and unique police collections. Examining social history records provides a window into Ireland of yesteryear. Street and trade directories are particularly useful if your relative ran a business. Findmypast has the largest and most comprehensive collection of Irish directory and social history records online. 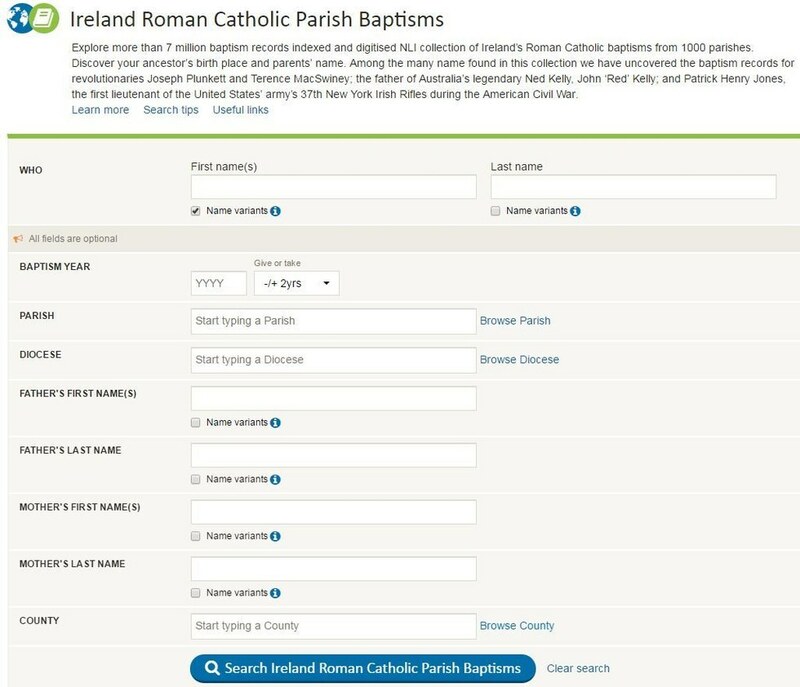 One of the smaller collections of Irish records on Findmypast but still useful in it's own right, our churches and religion category includes congregational records of several religious denominations. So now you know what records you can expect to find, how exactly do you go about unearthing them? There are a few basic searches you can try. Use the search box on the home page when you know minimal information on the person you're searching for. It will search all the Irish records on the site based on the criteria you enter. Make sure Ireland is selected in the 'Where' field. When you know what type of Irish record you want to find, you can narrow your search to just that specific category. You can access each of the nine distinct categories via the 'Search' option on the blue menu at the top of your screen. Once you select a category, you'll be taken to a dedicated search page for all the records that lie within that category. Carry out a search from this page and you can use the filters on the left-hand side to further narrow your search into sub categories or jump quickly into another category. Once again, you'll need to make sure Ireland is the country selected so you only focus on Irish records. 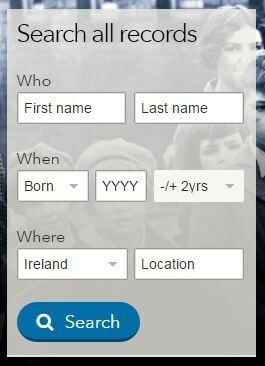 This should be used when you know the exact Irish record set you want to search on Findmypast. The quickest way of accessing individual record sets is through our A-Z of records. 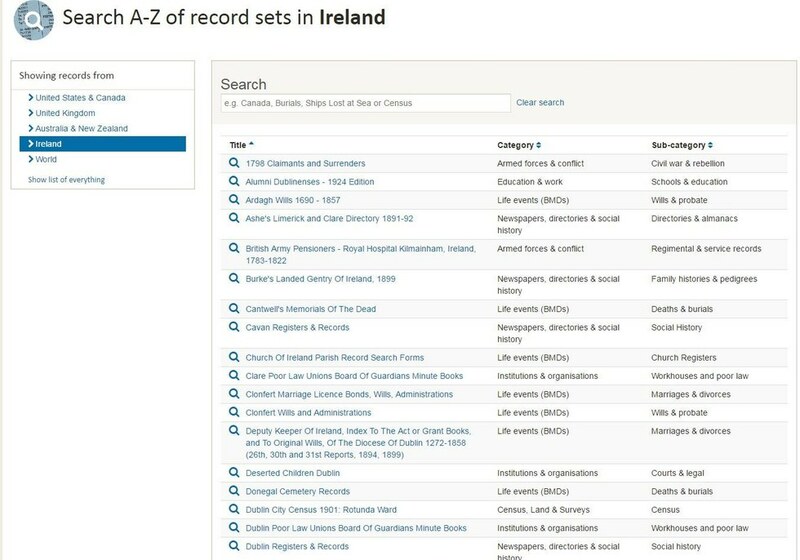 Ensure Ireland is selected from the 'Showing records from' list and then type the record set name or part of the name into the A-Z search bar and your selection will appear. 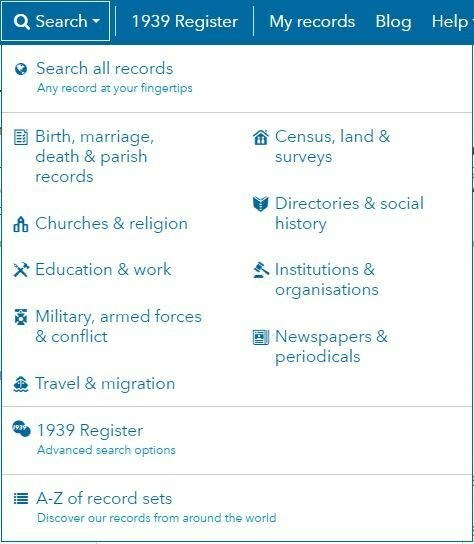 Once you've clicked on the Irish record set you want to search, you'll be taken to it's individual search screen which often includes search fields unique to that record set. This makes it really useful for pinpointing the specific record you're looking for.